A team of scientists from Sweden’s Uppsala University and the University of Heidelberg in Germany combed Gaia’s first data release of a billion stars from September 2016. They then cross-referenced it with observations from the Australia-based Milky Way-watching RAVE project looking for differences in how far away the two observatories place certain stars. 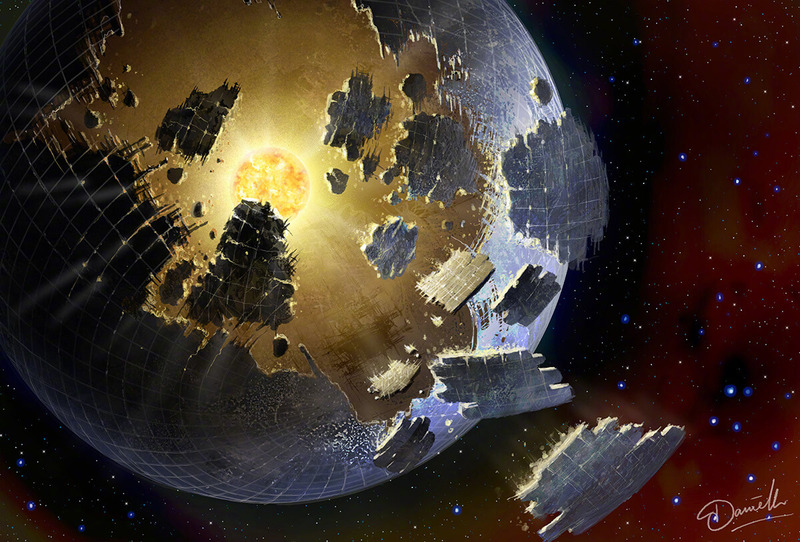 Artist’s representation of a crumbling Dyson sphere orbiting KIC 8462852. Simply put, the Gaia data shows how far away a star is by watching it move across a background of far more distant stars, an effect called parallax. RAVE data, on the other hand, estimates the distance of a star based on the properties of its brightness. So the scientists looked for stars observed by both Gaia and RAVE where the data seemed to disagree on the distance of a star. The idea is that the disparity in distance measurements by the different instruments could be explained by the presence of a partial Dyson sphere, a structure that envelopes or partially envelopes a star to harvest its energy. Science fiction has long envisioned huge alien megastructures like planet-size artificial spheres or rings or swarms of energy-collecting spacecraft. They’ve also been floated as a possible explanation for the strange dimming and re-brightening behavior of the now famous Boyajian’s Star, also known as Tabby’s Star or KIC 8462852. Cross-referencing the data sets revealed a handful of stars in Gaia data that may possibly be circled by such alien megastructures. However, upon closer examination, the team determined that errors in the data could account for differing measurements in the case of all but one star named TYC 6111-1162-1. The researchers used a third observatory to take a closer look at the star. They didn’t find evidence of alien megastructures, but instead of an unseen companion star, which could also account for the discrepancies in measurements. While they haven’t discovered advanced aliens just yet, the team maintains that their method of searching for possible Dyson spheres is still sound. They say the search will become even easier with future releases of Gaia data, which will provide both types of distance measurements for many stars. “We estimate that Gaia Data Release 3, currently scheduled for late 2020, should allow the technique to be applied to samples of (about 1 million) stars,” they write in a report uploaded to Cornell’s Arxiv repository of scientific papers. Meanwhile, the second Gaia Data Release dropped on Wednesday, with a fresh batch of 1.7 billion stars to check for ambitious alien construction projects. If anyone finds anything, please notify Elon Musk. He’s always looking for fresh inspiration.